A yearly thanksgiving is due to God on account of that day when we recovered the Church of God, with the demonstration of the dogmas of true religion and the overthrowing of the blasphemies of wickedness. Following prophetic sayings, yielding to apostolic exhortations, and standing on the foundation of the accounts in the Gospels, we make festival on this day of dedication. For Isaias says that the islands will be dedicated to God, meaning, [by the islands,] the churches from the nations and, by churches, not splendid church buildings, but the fullness of those who perform acts of reverence in them and worship the divine with hymns and praises. The Apostle recommends the same thing, when he commands us to walk in newness of life, and—by saying that if anyone is in Christ he is a new creation—to be renewed. Then there are the words of the Lord, which are to be taken prophetically: It was, he said, the feast of the dedication in Jerusalem, and it was winter. [By winter is signified] either the spiritual [winter], according to which the nation of the Jews stirred up storms of bloodthirstiness and trouble against the Saviour of us all, or that which affects the bodily senses when the air changes to being icy-cold. For there was a winter with us—along hard winter, and not just a fleeting season— one of great wickedness, spewing out savagery, but now there has blossomed forth for us the first of seasons, the spring of the graces of God, in which we have gathered together to make a thank-offering to God, a harvest of good works; or, to express it rather in the words of the psalm: Summer and spring, you have made them, remember this. For the enemies who reproach the Lord and utterly dishonour the holy veneration of him in holy icons, raising and puffing themselves up through their blasphemies: the Lord of wonders will tear them to shreds, and dash to the earth the insolence of their apostasy. He does not disregard the voice of those who cry to Him, Remember, O Lord, the reproach of your servants, the reproach of many nations that I bore in my bosom, with which your enemies reproached you, O Lord, with which they reproached the exchange of your Christ. For the ‘exchange of Christ’ means those who have been redeemed by his death and have believed in him, through the preaching of the words and the depictions in images. For it is in this way that the great work of the Economy, accomplished through the cross and the sufferings he endured and the wonders he worked both before and after the cross, is made known to those who have been saved. And the imitation of his suffering passes over to the Apostle and then to the martyrs, and comes down, through them, to the confessors and the ascetics. This reproach, with which the enemies of the Lord reproached, with which they reproached the exchange of his Christ, our God has born in mind. His heart is full of consolation, and he is inclined by the prayers of his mother, and the apostles, and all the saints. For they also shared the insolence shown towards him, and with him were set at naught in the icons, so that, just as they shared with him the suffering in the flesh, so in a similar fashion they shared with him in the insolence offered to the icons. Now God has at last made clear what he has willed today, and has done a second time what he accomplished earlier. For earlier, after the passage of many years when the holy icons suffered contempt and dishonour, he turned back piety to himself. Now, a second time, after a brief period of thirty years’ wickedness, he has restored to our unworthy selves freedom from vexation, the redemption of those who grieve, the renewed proclamation of piety, the assurance of the veneration of icons, and the feast that bears to us all these saving gifts. For in the icons we see the Master’s sufferings for our sake, the cross, the tomb, Hades slain and despoiled, the martyrs’ combats, their crowns, salvation itself, which the judge of the combat and giver of the prize and the crowns has accomplished in the midst of the earth. Today we make festival on this holy day, and making merry together and rejoicing in prayers and litanies, we cry out in psalms and songs. Who is a great God like our God? You are our God, who alone does great wonders. For you mock those who despise your glory, and show those who dare boldly to set themselves against your icon to be cowardly and put them to flight. But there is thanksgiving to God, and the sovereign trophy against the antagonists in these matters; yet another statement and detailed indictment makes clear the contests and struggles [that have taken place] against those who fight against the icons. These blessings have passed down from them to us, as from fathers to sons who are zealous for their piety, and curses overwhelm the parricides, who disdain the master’s commands. Therefore, we, as the community of piety, publicly inflict on them the curse which they have brought on themselves. Many years to the Basileis! God will protect their might. God will give their kingdom peace. Heavenly King, protect those on earth! 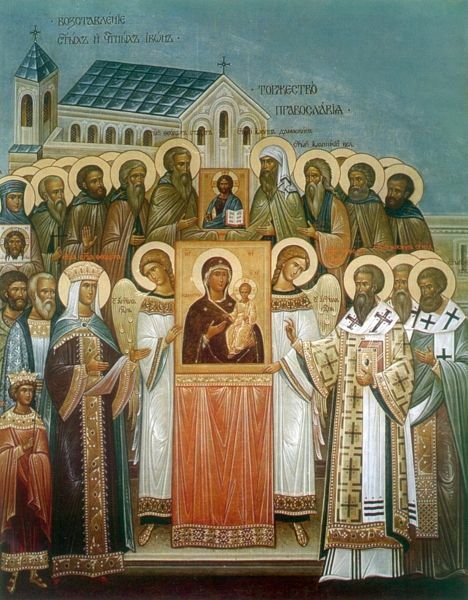 On the first Sunday of Lent in A.D. 843, the veneration of icons were restored to the Church. Since that time the Eastern Church has commemorated this event on the first Sunday of Lent with the singing of the Syndokon—the Triumph of Orthodoxy. The above text, translated by Fr Andrew Louth, represents perhaps the earliest extant version. Quote | This entry was posted in Theology. Bookmark the permalink.